NIMBioS postdoctoral fellow Emily Moran is interested in learning about how plants respond to changes in their environment. Moran investigates the impact of increasing CO2 on inter-genotype competition and plant-insect interactions in aspen forests in order to develop a modeling framework that could be applied to other forest communities. In the following interview, Moran explains her research and how she became interested in science and the field of ecology. Q: What is the purpose of your research? The purpose of my research is to understand how plants respond to changes in their environment, such as increases in CO2 or global warming. These responses may involve ecological processes (such as migration into newly suitable areas), evolutionary processes (such as adaptation to new conditions), or some combination of the two. For my post-doctoral project, I decided to focus on the question, "to what extent can atmospheric pollutants, such as CO2 and ozone, exert a selective effect on woody plant species, and how are the resulting changes in the genetic composition of the plant community likely to affect the animals that feed on them?" To address this question, I am using data from an 11-year Free Air CO2 Enrichment experiment done on trembling aspen in Wisconsin. 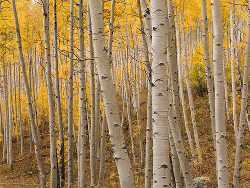 Replicates of five aspen clones were planted under ambient, high CO2, high ozone, and high CO2 + ozone conditions, allowing me to separate the effects of genotype and environment. Measurements of individual and/or population growth were also taken for several species of insect. Q: What could your research ultimately accomplish? One thing that I want my research to accomplish is to identify what we need to know in order to assess the vulnerability of particular species or ecosystems to rapidly changing conditions: How will changes in temperature and rainfall affect the birth and death rates of a species of interest? Is this species likely to be able to move into newly suitable areas on its own or will it need human assistance? In addition, I also want to contribute to the theoretical understanding of how ecological and evolutionary processes interact over short timescales, which is relevant not just for climate change, but for species invasions, the development of disease or pesticide resistance, etc. Q: How/when did you become interested in your field of research? I have been interested in plants and animals - how they live, what they do, how they interact with one another – for as long as I can remember. As a child, I loved to play in the woods or in my parents’ garden, and would spend hours watching ants or collecting leaves. I liked to read about more exotic places too, like rainforests and coral reefs. The more I read the more worried I became that all these amazing things might not be around when I grew up. So, very early on, I became interested in both science and conservation. When I started my PhD, I became interested in how new statistical modeling and simulation modeling techniques could shed new light on old ecological problems. The same was true for molecular techniques, which can now help answer long-standing questions that were previously almost impossible to answer. So, I would encourage any students out there who are interested in any science to read broadly, and to learn as much math as you can. You would be surprised when it comes in handy! Q: Tell us something about your field of study we might be surprised to know. I think many people would be surprised by just how much is still unknown about the natural world, and about ecology in particular. In school, science is often presented as a sequence of tidy facts, when really it is all about questions. For instance, we know that birds disperse seeds, but how far do they really carry them, and what does that mean for the population dynamics of the plant? For a long time, ecologists tended to not consider evolutionary processes, assuming that any evolutionary change would be too slow to affect what happens on ecological time-scales. Now there is increasing evidence that within-species evolutionary change can happen quite quickly, and that plant genotype can have effects on the insect community that are as big or bigger than the effect of other environmental factors. Q: Do you have an interesting "personal side" to your research? I think a lot of my best stories come from field work. I’ve had alarming adventures, like the time I stepped on a yellow jacket nest. I ran like heck for a few minutes, then realized the yellow jackets were clinging on, so I stopped and killed them with my water bottle. There was a police firing range near that field site, and one of the officers stopped to see what was going on. I was fine, though I did get about 30 stings! Another time I needed to get leaves down from the canopy for genetic analysis, so I learned to use a slingshot. Sometimes you just have to laugh: on my very last day of leaf harvesting it rained for nine hours. I was walking around like a duck because my pants were wet and my pockets were full of rocks and the slingshot band broke just after I shot down the last leaf I needed. I’ve also learned to drive stick-shift in a truck, on a mountain, which was a bit of a challenge. And of course there are things that make even the hardest day seem worthwhile: half a dozen wild turkeys roosting in a tree (a ridiculous sight, since they hardly look like they can fly), a beautiful little green vine snake, or fall colors that would take your breath away. Q: Why did you apply for the post-doc program at NIMBioS? The NIMBioS postdoc position allows me the freedom to chose and direct my own research project. I was interested in continuing to develop my quantitative skills and in applying these skills to investigate the role of genetic variation in species and community responses to climate change, and this has been a great place to do that.